It’s a tremendous privilege to raise children, though for a quite different reason than most of us who are parents imagine. 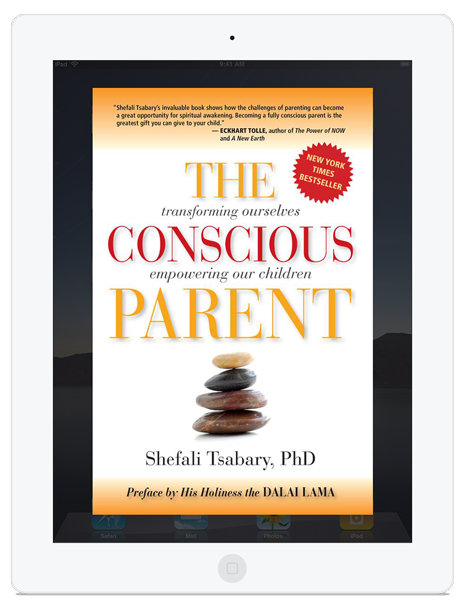 While we think it’s our responsibility to mold and shape our children’s future, the essential premise of Dr. Shefali Tsabary’s A Call to Conscious Parenting is that our children are born to us to create deep internal transformation within us. Peppered with practical, hands-on examples from Dr. Tsabary’s real-life experiences with the countless families she has helped journey consciously together, A Call to Conscious Parenting is a manual for giving our children the opportunity to shine and dazzle with their natural state of being. What a great eye opener! 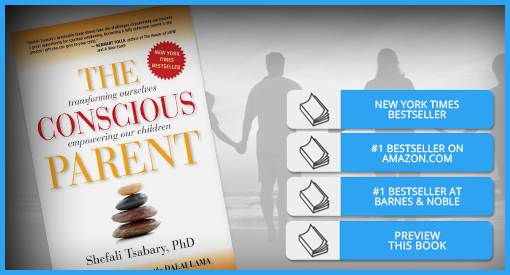 The Conscious Parent is a must have book for any parent. There is so much good information that will change your prospective of parenting. This book also reveals some of the things that we learned as children that we are now using our own parenting in why it may not be the best way of parenting our children. Dr. Tsabary’s insight is God’s blessing to every parent. This book is the perfect baby shower gift! Great book!!! Love her perspectives. 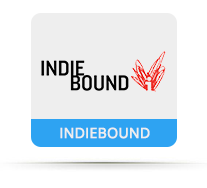 Challenges the reader to look deeper into themselves. Clearly- not everyone is ready for this. We had already raised our children when life threw us a curve and as grandparents, we suddenly found ourselves as parents of an 18 month old. We have now completed the adoption, she is 3 and this book has been an excellent tool to ensure we are conscious about our process, living in the present moment; not only with her, but in other interpersonal relationships. Wish we had this book many years ago. Excellent guide about how to parent your children and understand how that process affects and transforms the parents’ themselves. This was a much-needed contribution to the knowledge of the realities of parenting. Dr. Tsabary normalizes all of the ups and downs both emotionally and psychologically that parents can experience when raising their children. Highly recommended for those parents who are committed to both raising children with awareness and to “raising” their own level of awareness spiritually, emotionally, mentally and psychologically. Today, parents are completely distracted with their iPhones and social media, not to mention work. Parents are accessible for work 24/7. The boundaries are now blurred because we have been bombarded with technology in a short period of time. I’m glad that I had access to this book while my children are still small. This book helped me put my own situation in perspective as I have a gifted child and a child with special needs. Both require different things from me. We’ve recently found their passions in gymnastics and golf. I’ve become more conscious of not pushing my agenda on them but helping them cultivate their own unique strengths. My whole life, my family pushed their agenda on me in areas I didn’t shine or care for. Even though I grew up successful using my own strengths, the fact that I had to go against their wishes still created an underlying insecurity that still exits. I’ve noticed the more I am present for my children when they need it, they become less clingy and more content they are. Unfortunately it’s taken a whole generation to begin convincing society to see the negative effects of helicopter parenting, over-scheduling kids’ activities, and not allowing children to fail/learn from their mistakes early on before it becomes life changing. I never understood this trend but I’ve felt the enormous pressure the conform to it. These trends are discussed in the book and it goes into detail why it can be so damaging to a child’s sense of independence. It’s a good book to read if you are the type of person who can tolerate self-reflection. I have a 18 year old son. I thought a book like this would be of no help to me as he is an adult. But I was very wrong. This book has helped me learn how not to over react and to stop trying to fix everything. It is important to realize that things happened and there is nothing we can do about it, we can only control how we react . I am sharing this book with all of my friends. I’m half way through the book and can’t wait to see what I learn next!! Loved this book. I got so much out of it. Only wish I had discovered it early on in my parenting but even having read it when my kid’s are age 12 and 19 I still got a lot out of it. You need to be willing to let go of your ego and look at your behavior and reflect on what you are doing to contribute to the behavior of your child. You have to accept it might be you that needs to make the changes in order to have an authentic relationship with your children. I was willing it is very important to me to have the best relationship possible with my children and this book is the perfect guide in accomplishing this. You might even learn a little something about why you have the relationship you have with your parents during this reading, I did. Dr. Shefali is great! She breaks down a child’s mind in such a great easy to grasp way. She gives great examples and possible dialogues to use during those tug of war times with children. She even gives personal experience to show what works and what doesn’t. Was a great read and I feel like I’m better prepared to raise my one year old. I will definitely recommend to all parents. Every parent wants the golden key to raising well-behaved, academically gifted, successful, happy children. Embedded in the collective psyche is the notion that discipline is the cornerstone to achieving these goals. 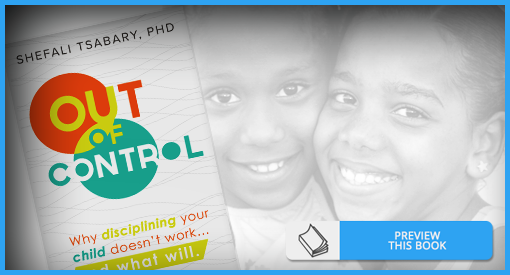 Out of Control offers a never-before-published perspective on why the entire premise of discipline is flawed. Dr. Shefali reveals how discipline is a major cause of generations of dysfunction. The author goes to the heart of the problems parents have with children, challenging society’s dependence on discipline, daring readers to let go of fear-based ideologies and replace them with an approach that draws parent and child together. This is perhaps the most useful parenting book I have read. The title doesn’t do it justice. I would have called it something far more positive – like the content within the pages. The author teaches methods for connecting with your children by analyzing the feelings behind the behavior. And encourages parents to really consider what baggage and expectations that they are bringing to the conflict. Good for parents of all age children. I am grateful to have found it early in my boys’ development. Shefali Tsabary is brilliant in the simplicity of her message. Just because the message is simple, though, doesn’t mean the application is easy. But we are all grownups. We can do this. This book has completely changed my life. Anyone who wants to be a thoughtful parent and truly enjoy being a mom needs to read this book. Learning to accept others “as is” may be difficult but once applied gives you a whole new perspective on life. .
Another book from my daughter who has a 2 year old son. . I submit it is worth it for teachers and anyone who deals with youth. 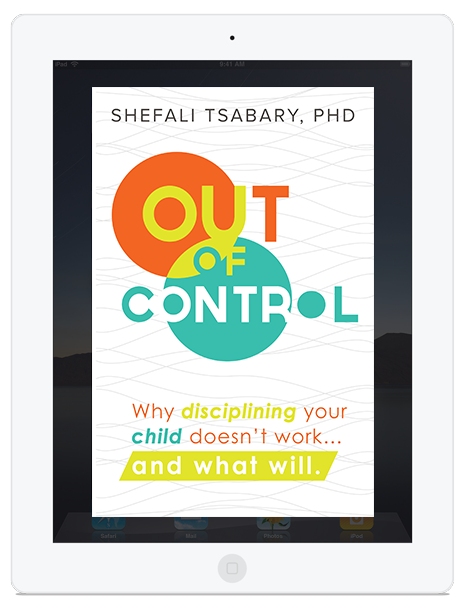 The major premise of this book and for Ms. Tsabary’s other book “Out of Control” is that ‘discipline’ as most of us know it is not the way to actually help our children grow and succeed in the world. Discipline means to teach, not to threat, hit, scold, berate, pick on, howler at, belittle, etc our children. That is the sure way to eventually stifle their ability to grow and become the best person that they can be. She believes that we need to be ‘in the moment’ with our kids. In other words, try and see the world through their eyes and relax. It isn’t about us, it is about them. Many times we get upset with our kids because they don’t do it ‘our way’, or listen to exactly what we want them to do. By not pushing our agenda onto our kids, we can learn and grow with them. Then when they are teenagers and start facing more grown up issues, they won’t shut down against us, but instead will see us a a resource that they can use to navigate growing up. Of course there a limits, – safety, well-being, politeness, etc. However, the list is small, not as big as most of us adults make it. This is a simple synopsis of the book, but it makes the point, I believe, that the author is trying to convey. So many children today are bereft of love and attention for which they are longing. The book is worth reading if it can make an authority figure stop, even once, to reevaluate their position with any child. Again, it isn’t about the adult, which most of us make it to be, it is about the child and what is best for her/him. This is such an important book. Especially right now. We know that forceful manipulation of others to obtain our desires just doesn’t work in the long run. On any level. Dr Shefali holds our hand as she guides us another way to getting what we really want for our children- their own sense of self- a strong foundational center from which their own inspired actions arise naturally. When we are connected with our children we often can address issues before they become a problem. And when problems do arise we are so connected that solutions naturally present themselves. In a time like now when the old hierarchal/patriarchal models have crumbled Dr Shefali leads the way to the next evolutionary step in parenting. It’s comforting to see the new path so clearly defined yet make no mistake, it is no picnic to actually walk it. The messages are specific to parenting but are relevant to all relationships and society as a whole. While Out of Control focuses on the aspect of ” discipline”, The Conscious Parent covers a wider spectrum of parenting concerns. Both are a must read. r. Shefali’s groundbreaking book is the one book every parent should read. I cannot put it down or stop referring to it in my conversations with friends and co-workers. It will change the way you see your role as a parent and yourself. There is no blaming or shaming. Simply kind and inspirational. 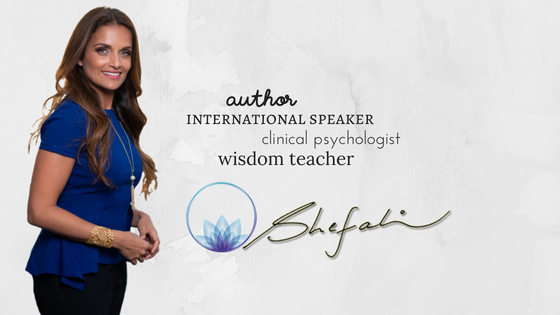 Dr. Shefali holds up the mirror to readers and inspires us all to take control of ourselves and watch the impact on our children. This is simply the BEST parenting book ever written! I will explain why, and also offer a small critique. But first the good stuff: This book will make you take another look at your role as a parent – what is it that you have to do? And it will make you take another look at your own childhood – what did your parents do? It will enlighten you to the fact that you are projecting all your expectations, your fears, your ideas of how things “should be” onto your kids. And your parents did it to you! And their parents… and so on! So we can see very clearly where our thoughts come from, how we identify with said thoughts and then put it upon reality to prove these thoughts correct – in this case, we hold our kids responsible to behave in the way we expect. Just with that introspection alone, you can not only learn about your kids, but also about yourself. This book achieves what many other books on spirituality fail to address – how can you be conscious _with_ your kids. As it turns out, there is no contradiction; and in fact your kids, being as they are, are wonderful guides to bringing you to learn more about yourself. If all that sounds a little much – never mind. All the chapters are structured so as to be immediately useful. You can practically apply most lessons in this book. And it will make an immediate difference in your life. I consider that practical aspect the most important – because we, as parents, have a lot on our plate already; we’re stressed out, we have tons of stuff to do, and we don’t have time for lengthy experiments or long term considerations when all we want to do is to get the kid to shower and get ready. If I had to criticize anything it is that the author also doesn’t have all the answers. There’s a lot of grey area to the “natural consequences” chapter. I would say in day to day life, only about 50% of all situations are so clear cut that “natural consequences” work. The rest, it does not apply. Either there’s outright danger, where our role as parents require intervention to guarantee the health of our kids. The book allows for that, but it’s everyone’s call as to which situations are actually harmful and which aren’t. It’s a grey zone. And there are other things where parent action or inaction causes consequences that cannot really be called natural. There’s a temptation to “create” natural consequences. So all in all, that concept needs to be taken with a grain of salt. It often works, but just as often, doesn’t. When I read the book I found it to be meandering a bit, explaining some things I already knew from watching the author’s talks and public appearances. But then chapter 9 came along and that hits hard – you are not a movie maker, and your life is not a movie – and this is something that applies to all areas of life: Kids, your partner, work, all interaction with others. It’s amazing. It might change your whole life, even.